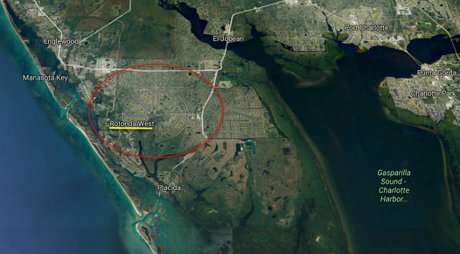 A peaceful, planned community situated in the round near the beautiful Gulf of Mexico, in southwest Florida. It is located mid-way between Sarasota and Fort Myers, a short distance from Port Charlotte. The community contains 8,000 home sites with over 5,000 homes completed and is experiencing rapid growth. Residents are predominantly full-time homeowners. This unique residential community sport five golf courses operated by Rotonda Golf and Country Club. There are over 30 miles of picturesque canals winding their way through the community as well as several lakes and ponds. Many exotic and beautiful birds and other wildlife call Rotonda West home. Nearby recreation facilities include beaches, theaters, sporting events, Fishing/boating and fine restaurants. Rotonda West enjoys several social clubs with activities, and many volunteer opportunities abound for those who wish to become involved.